We long to see firsthand the power of God as displayed in the Bible. Miracles, prophecy, dreams, healing--most of these tend to be missing from our normal, safe, predictable faith. Yet we tend to view any movement of God outside our own experience with mistrust and confusion. But what if we've got "normal" all wrong? In these pages is an invitation to a new way of living: embracing God's power through simple yet bold prayer. It's for the night owl, the caffeine-addicted, even the skeptic, beckoning all of us out of our comfort zones with stories of spiritual breakthrough, mind-blowing miracles, and physical healing. Here are the tools you need to work through your doubts, open up to the miracles of God, and walk in the power of the Holy Spirit. You will learn to hear God's voice, trust his leading, and walk empowered by limitless prayer. It is time to see God transform your faith into a thrill-seeking adventure. 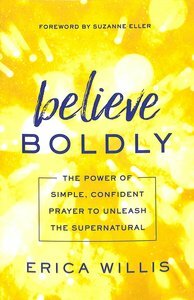 About "Believe Boldly: The Power of Simple, Confident Prayer to Unleash the Supernatural"
Erica Willis is the founder and director of The Fives, an international prayer ministry. A leader in the local church for over 20 years, she has served as a church planter, children's pastor, small group director, and women's ministry director. She teaches weekly in the women's ministry at her church of 2,000, blogs regularly at BelieveBoldly.com, and speaks nationally at women's events and conferences. She and her husband, Joey, have two children and live in Weatherford, Texas. T. Suzanne Eller is a full-time author, freelancer, and ministry speaker. She has written articles for magazines such as Christian Parenting Today, Today's Christian Woman, Guidepost, and many others. In addition, Suzanne is a youth culture columnist for Enrichment Journal and travels around the nation ministering to teens, parents, and youth workers.